My first job in broadcasting began almost 15 years ago at a television station in California's North State. KRCR Channel 7 in Redding was one of those small operations where you had the opportunity to learn and try pretty much everything, as long as you filled air time. I joined as a producer, spending my days preparing our evening newscasts while coordinating field coverage with our team of young, talented reporters. A year after I arrived, I became a field reporter myself. My first experience with a major wildfire came within months, in August 2004, when the Bear Fire was sparked by a man mowing dry grass on a 106-degree day. Three days later, the French Fire ignited. Each burned more than 10,000 acres in Shasta County. I still remember the names of the major wildfires that hit the region well before my arrival in Redding. No one there could forget the Fountain Fire of 1992 and the Jones Fire of 1999. The Jones Fire burned nearly a thousand structures by the time it was over. At the time, that seemed like a lot. 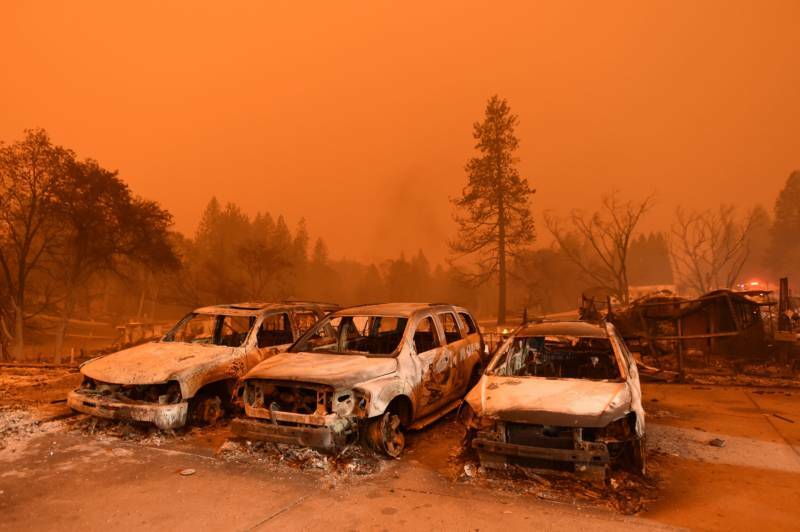 But, for perspective, the Camp Fire, which was fully contained over the weekend, took down almost 20,000 homes, businesses and other buildings in Butte County. Back then, nearly all of the major wildfires took place between the months of July and October. In 2006, I moved to New York. I never would have imagined that the next time I'd set foot in the North State would be 12 years later to cover a fire that would virtually level several communities. The world now recognizes the town of Paradise, whose charming welcome sign I'd seen countless times while editing video for my station's newscasts. The sign read: "May you find Paradise to be all its name implies." What didn't seem familiar was this: It was chilly during fire season. The idea that you'd need a winter coat while covering wildfire seemed -- quite simply -- unnatural. That's because it was November. Fifteen years ago, fire season didn't last that late into the year. I filed this observation in the back of my mind until this holiday weekend, when the U.S. government released a stunning climate report on the Friday after Thanksgiving, when it got far less attention than it's due. The Fourth National Climate Assessment reflects the research of scientists from across the federal government. It tells us the following: The frequency of wildfires is increasing; fire season is indeed getting longer; and exposure to fire risk -- for both people and their property -- is going to get worse. And, the report says, these shifts are caused by human-caused climate change. Yes, that phrase is used in a government report, and it's a key premise, not a topic of debate. The report writers -- a panel representing 13 federal agencies -- argue it's only going to get more expensive to deal with the interconnected impacts, which include health effects, emergency response and fuel management. As the Camp Fire taught Bay Area residents, impacts like abysmal air quality aren't restricted to those living near the the wildland-urban interface, a phrase that's now entered the California lexicon. The U.S. Forest Service describes it as the zone "where houses and other development meet or mix with undeveloped natural areas". About a third of Californians now live in these areas. The key conclusion laid out in the National Climate Assessment is that global warming could force millions of Americans to move. And the U.S. isn't prepared. Given the current state of our politics, the prospects of working together to address this look grim. Oddly enough, this report was released by the administration of President Trump, who has called the concept of climate change a hoax. During my coverage of the Camp Fire, I ran into someone whom I hadn't seen in more than a decade: Congressman Doug LaMalfa. He's one of the few California Republican incumbents re-elected to office earlier this month. During my time in the North State, LaMalfa was a state assemblyman known for his white Stetson hat and his day job as a rice farmer in the community of Richvale. I saw him at a Cal Fire press briefing in Chico shortly after the Camp Fire broke out, before President Trump had visited the region but after he'd fired off on Twitter about California being to blame for its forest management practices. In the past, LaMalfa has said he doesn’t “buy the idea that man-made activity is responsible” for climate change. When I asked Rep. LaMalfa about the personality clashes between President Trump and both Gov. Jerry Brown and Gov.-elect Gavin Newsom, he brought up the crisis at the Oroville Dam, when nearly 200,000 people were forced to evacuate after the dam’s spillway system failed. "That was right at the height, immediately after the president's election and swearing-in, when California decided to go on a complete jihad against the president for opposition purposes,” Rep. LaMalfa told me. “But soon after that, the governor had to make a request of the president, and I also called the White House to pave the way," he said. "The president has responded within a short amount of time on every single disaster that California's asked about." The price tag of the spillway incident now stands at $1.1 billion, and FEMA may end up picking up as much as 75 percent of the tab. But no one lost their lives or their homes, like so many have in Butte County this month. Sadly, the spillway disaster offered a dry run for evacuations that have gone on far longer for Camp Fire victims. The fight against climate change has emerged as a signature issue for Brown, who’s preparing to leave office. Newsom seems prepared to continue that legacy. Earlier this month, Trump stood side by side with both men in Butte County. They were civil and professional. If the National Climate Assessment is correct, much larger-scale evacuations loom on the horizon. The question is, will we have planned for them, or will we simply continue to react after the fact?